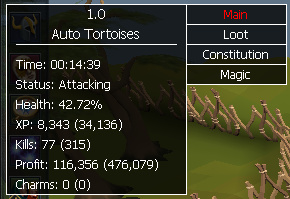 Fights and kills Tortoises in Gnome Stronghold. No requirements, but a strong Air spell (tortoises are weak to Air) is recommended. Testing will post a proggy in a couple hours! Thanks for all your scripts! forgot to take a picture but ran it for 45 minutes... ran great just wasnt quite enough money per hour for me to use... I got about 150k an hr with it. I might have had bad luck also though. The profit in the paint isn't always accurate. It's a client issue that breaks background threads. Check your bank: I can guarantee you'll have a lot more than 10 shells there. How many kills/hr are you getting? Can you use melee? or just magic? You can use melee, but it'll slow you down since they have pretty good defense. I didn't add eating because they don't do much damage. So if you're falling below 30% health, then you should probably train your defense. It loots and eats the worm battas, though. you should make it bury bones as an option as well,for that added prayer xp. please. I am also having a problem with health (all my stats are high 50's). I found that when my adrenaline was full I could pause the script, use regenerate then resume it and I was fine - could you put this into it? Why its banking food, i have more food than shells banked, please take this off, but thx for script, working great ! You should Add Burying Bones, Prayer training while Farming is Always good. Should add a food option, I thought it had it. Had the sharks in my invent and then it went to the bank when it got the to the first shark haha..
other than that its a good script though so far i havent had any problem. edit: i am also running it in Legacy mode and having no problem, I was just reading someone was having problem with the RS3/Utility bar.